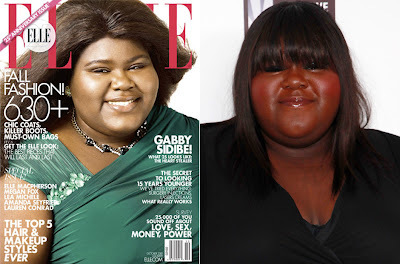 My first introduction to the beautiful Ms. Gabourey Sidibe was her 2009 debut performance in the heartbreaking movie, Precious, based on the novel, Push, by Sapphire. Unbelievable performances and much deserved Oscar win for Mo'Nique (Woot woot!). If you haven't read the book or seen the movie, put them both on the top of your to-do list. Just make sure to have a box of tissues by your side. A native of Brooklyn, New York and raised in Harlem, Sidibe had no interest in acting after witnessing her mother's financial struggles with singing. While pursing a psychology degree, she received a call from a friend about the Precious audition, ended up skipping class and the rest was history. Sidibe can now be seen on the Showtime series, The Big C, starring Laura Linney. Then came along the 2010 Elle cover controversy. At the time I had a free subscription, and I remember my initial reaction when I received my copy was, "how awesome that not only does the cover have some color, but a size other than anorexic." I didn't notice, however, the lightening touch-up, until the news coverage. Comparing this cover to other Sidibe pictures, it's rather apparent that the skin color differs. And that's not all. As pointed out in Julianne Hing's blog post, Sidibe didn't get "the standard female cover photo treatment: three-quarters of the woman’s body centered with strong margins of white space on either side." Instead, the cropped shot hides her full-figured body and unfortunately zooms in on that awful wig. Hello? Isn't this a fashion mag? I guess specializing in one type of model, skinny white chick, leaves them lacking in styling techniques. Elle's spokeswoman quotes to various news outlets that "nothing out of the ordinary was done" with Sidibe's cover. So, I guess the "ordinary" standard is that cover models must be light: in both skin color and body size. Sad to say, not a shocking revelation. And how can you not love her after seeing this entrance on Ellen? Awesome. Caught her interview the other night on Chelsea Lately. She's hilarious. She shines with such a fresh, fun energy; a girl I'd love to hang out with. Couldn't find the 2012 interview, but the 2011 shown below was just as cute. A true inspiration. I look forward to watching Sidibe's career rise and wish the curvy star nothing but success. I share Ellen's sentiment, never stop doing you.